Mature Dicymbe corymbosa tree exhibiting typical reiterative architecture, including multiple stems and roots, a large root mound, and accumulations of elevated organic materials. The four microhabitats sampled for ectomycorrhizal (ECM) roots are: aerial litter (AL), aerial pockets of decayed wood (W), root mound with deep organic deposits (RM) and mineral soil on the forest floor (MS, yellow arrow, bottom right). 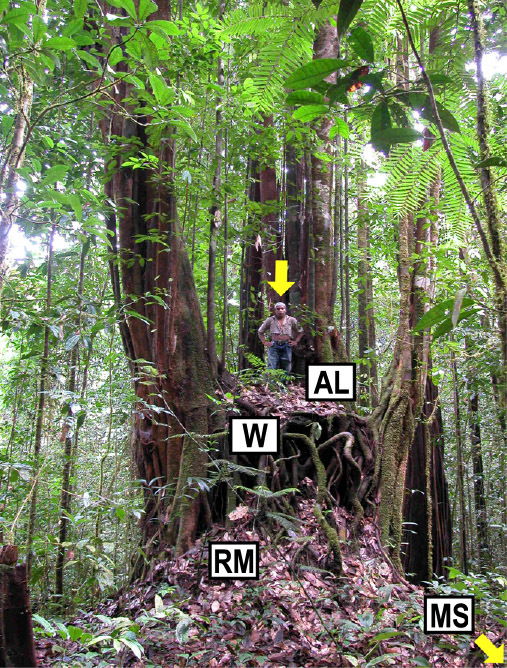 The top yellow arrow points to field assistant Peter Joseph, included for scale. Several dominant fungi were ubiquitous but analyses nonetheless suggested that communities in mineral soil samples were statistically distinct from communities in organic microhabitats. These data indicate that distinctive rooting zones of D. corymbosa contribute to spatial segregation of the fungal community and likely enhance fungal diversity. Smith ME, Henkel TW, *Williams G, Aime MC, Vilgalys R. 2017. Investigating niche partitioning of ectomycorrhizal fungi in specialized rooting zones of the monodominant leguminous tree Dicymbe corymbosa. New Phytologist 215: 443-453.